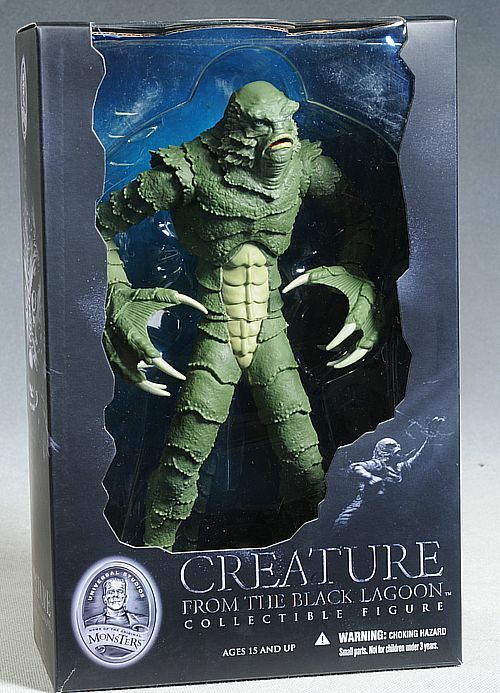 There have been lots of companies that have produced collectibles and action figures based on the classic Universal Monsters license. It's almost like a right of passage for every company, and some pass the test better than others. Mezco picked up the license this year to produce several figures in a large scale - around 10" - and in their own unique style. 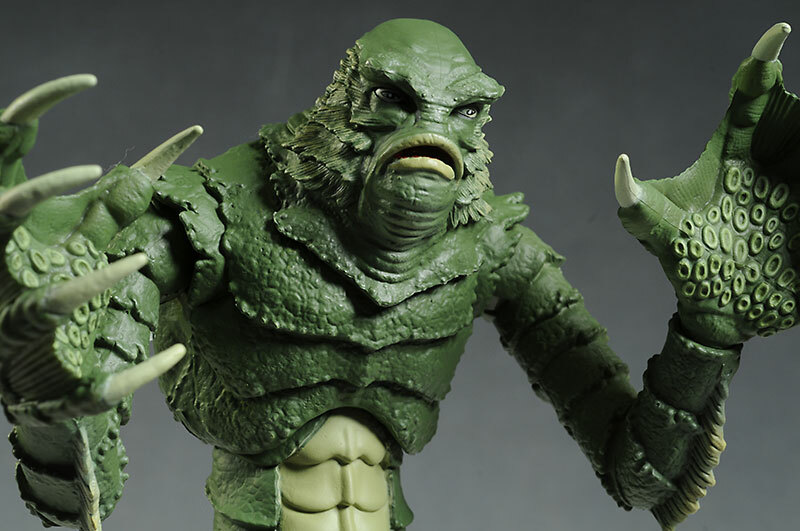 They've already released the Frankenstein Monster, which I reviewed awhile back, and now they have my favorite of the old film monsters out - the Creature from the Black Lagoon. We'll be seeing the Mummy as well, but he won't stand a chance up against the Creature. Like Frankie, there's not just the regular release. They are producing both a black and white and glow in the dark version, available through their store or at SDCC in a few days. This regular release is available at many online retailers for around $25 or so. The exclusives are much more expensive (and much more limited) at $60 each. Just like the Frankenstein release, he comes in a nice black and white window box, sturdy enough to handle storage or shelf wear, and perfect for the MIBers to store. There's very little wasted space, but there are still plenty of damn twisty ties. Grrr. Mezco does their own thing when it comes to their designs. While some are done in a very caricature style, these pulled back a bit with these, making them close to the original designs...with just a little Mezco style thrown in for good measure. I like it quite a bit. He's not cartoony, yet he's not completely identical to the more film accurate versions by companies like Sideshow or DST. It makes him stand out on the shelf, but not in a silly or ridiculous way. He's a big figure too, coming in at almost 10", which means he should tower over any other all plastic versions in your collection. There's plenty of detail work in the sculpt too, especially in the skin textures and scaling. The over sized hands look amazing, and the slightly odd proportions give him a unique style. The paint is decent, but not the sort of thing that will take you off your feet. Edge and lines are fairly clean, and there's a good transition between the various green shades of his body. The eyes look a little walleyed...which may or may not be on purpose. He is amphibious after all. This was the one area that surprised me, because in the package (and in photos), I got the impression that there were plenty of joints. When I got him out of the box, I found that wasn't true. There's a very good ball jointed neck, as well as a ball ab-crunch. These work well with the pin/disc shoulders to get some decent upper body poses. Unfortunately, the elbows are only cut joints, which means the arms have to remain bent. The waist is a cut joint as well. The wrists and ankles are pin/disc ball joints, so they turn, tilt and move on both axis. The ankles are a tad loose though, and you can have a little trouble keeping him standing if they aren't just so. If you are paying attention, you've picked up on the lack of leg articulation. No hips, no knees, no cuts of any kind. I hadn't expected that, and it means you're pretty limited when it comes to poses. Nope, nothing here. Of course, he's not the best figure to have extras - it's not like he used a lot of stuff in the movie. A net, maybe? The lack of articulation hurts the playability a bit. Still, he's a great looking monster with some solid heft and large size. That appeals to kids, as long as they have some heroes in the same scale to do battle - or some smaller ones so they can pretend this Creature is a giant. 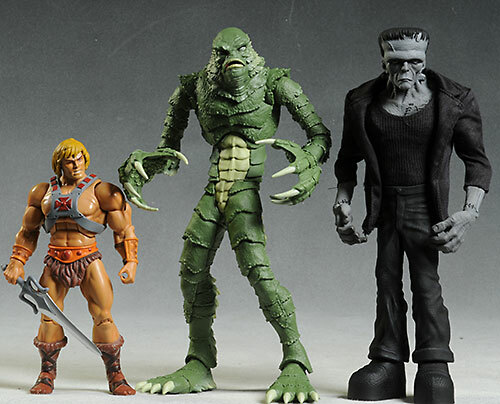 You're paying $25 for Masters of the Universe Classics now, figures that are much shorter than these guys. While I'd like to see an accessory or two at this price point, I also know that even the regular release is a pretty small production run. I wish the articulation were a trifle better - that would have helped this score quite a bit. Even adding in an accessory or two at the price point would have gone a long way to upping the score another half star. 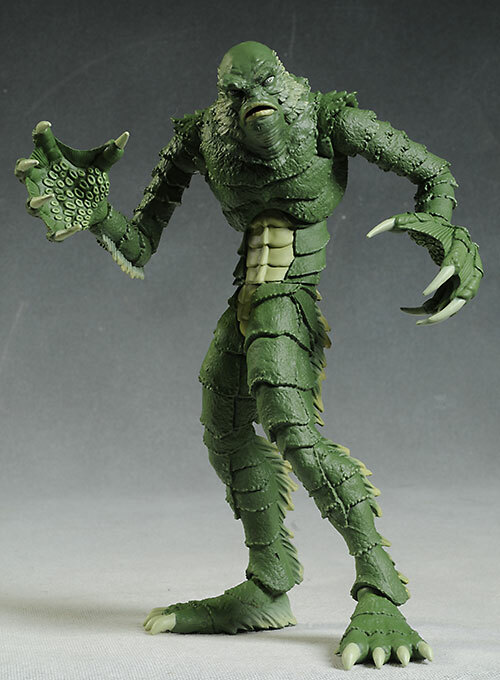 But as a huge fan of the Creature, I have to say that I'm very pleased with the design and style. They aren't over the top caricatures, but there's enough difference between the film appearance and these to make things interesting. I'm hoping we see more of the series at SDCC, beyond the Mummy that we know is coming soon. - Entertainment Earth has an excellent price at just $23. - is also at $26. 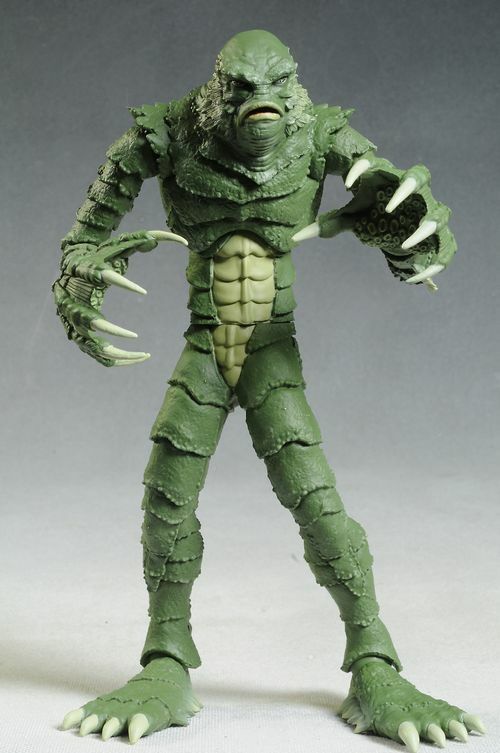 Mezco also did a large Frankenstein to go with the smaller Frank that matches up with this Creature. 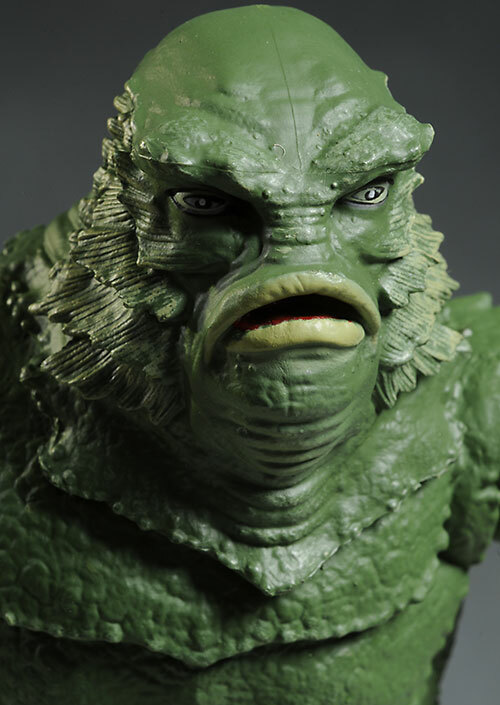 Other Creature products include the recent black and white bank, the goofy Monster Pals version, the Sideshow PF (one of the nicest collectibles produced), Sideshow has done a great 12" version, and one from the later film, The Creature Walks Among Us, the most recent smaller figure was from Toy Island, and this mini-bust might not be an official Creature, but it's mighty close.